overlooking green fields, tended farm land and woods. Below, about 30 minutes by foot, was the small village of Aham by a river. The area was open, peaceful and quiet, quite cold and rainy in the first days but then sunny and warm, a wonderful place to practice twice a day, two 2 and ½ hour sessions under Nina Robinson’s generous and knowledgeable guidance. In the morning and afternoon, Nina explained the Mandarava practice in all its facets, the visualizations, mudras, pronunciation of text, Chudlen, use of the bell and vajra. All the practices of Sogthig and Tsalung over the seven days were explained and immediately practiced in the following session. Two yantra yoga sessions, early morning and afternoon, were led by Jan Dolensky (Honza), third level instructor, with the aim of helping one coordinate movements and breathing and work on understanding all the more the breathing in Sogthig and Tsalung practices. Thank you, Nina, for all you shared with us. And for your help and materials (ribbons, glass beads, peacock feathers) to make beautiful Dadars. 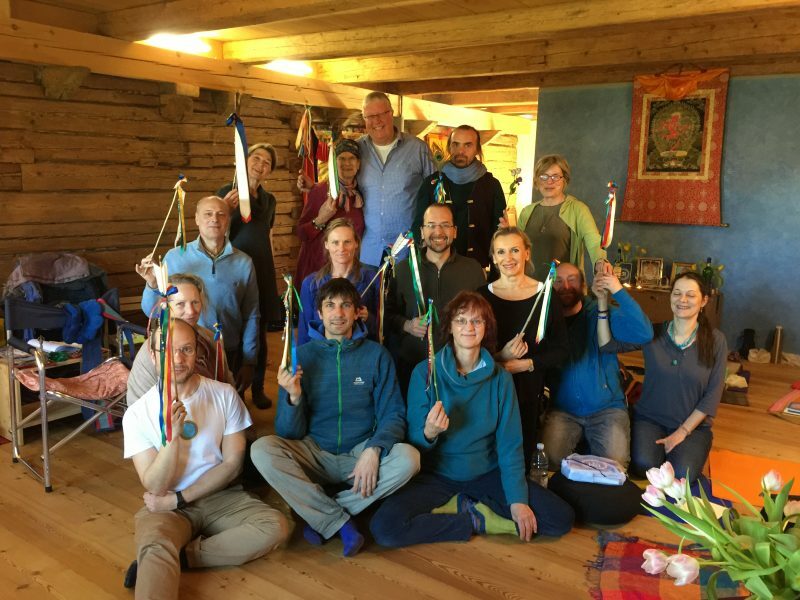 The retreat was organized by the Gakyil of Yeshiling, Munich, and was attended by 15 to 20 practitioners daily. I wish to thank Satori and Frank at this point, for all their kindness in organizing and taking care of Nina and all of us.